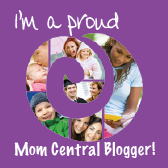 I am sharing this post as part of a collaboration with Bloggin' Mamas and The Hometown All Stars. I received books and other items in exchange for my participation. All opinions expressed are my own. Do your kids love playing sports and being active? Here in the Cleveland, OH area, sports are a HUGE deal. HUGE. Now if only one of our teams could actually WIN....But that's a different post entirely. This book serves as a wonderful introduction to baseball. Kids will learn a bit about the sport, as well as several new words. 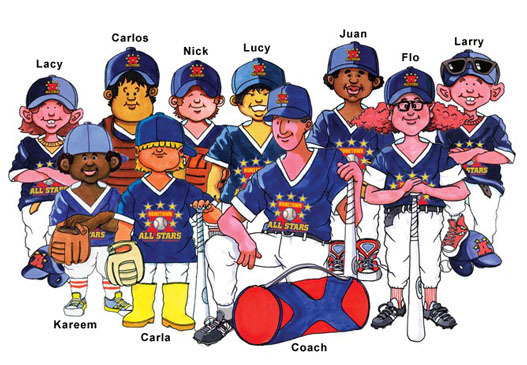 There's a lot of info packed into this fun story, and kids are sure to learn a lot about America's favorite pastime. They'll be ready to hit the baseball diamond before you know it! This book is really cute, and helps teach little ones proper baseball technique. I remember holding a bat when I was little, and it can be tricky to get it down correctly! I love the fact that this story encourages children to give it their all, and always keep trying! Eventually, they'll be hitting homeruns of their own! Give­away begins Novem­ber 26th, 2015 at 12:01 am EST and ends December 10th, 2015 at 11:59 pm EST. Open to US res­i­dents age 18 and older. Win­ner will be selected by Random.org and be noti­fied by email. See Give­away Tools wid­get below for full terms & conditions. 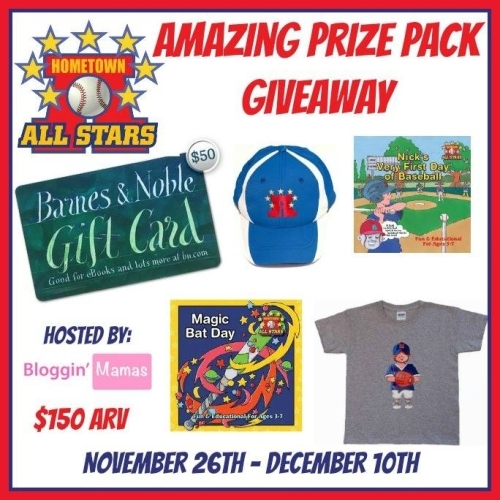 Dis­clo­sure: Blog­gin’ Mamas is host­ing this give­away and the Sponsor is responsible for prize fulfillment. While I received the items mentioned above, all opinions expressed are my own. 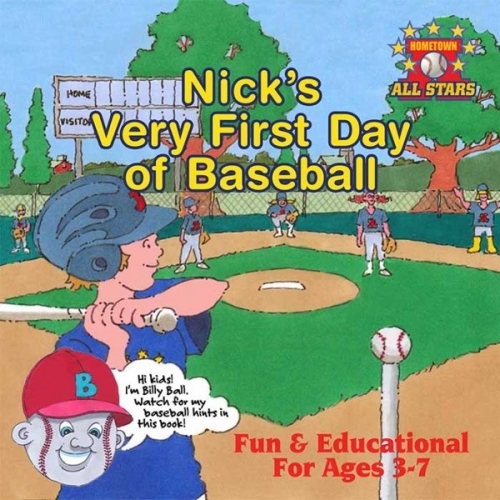 I would like Nick's First Day Of Baseball. I think its cool that it focuses on teaching early sports skills along with interactive, educational activities and encourages children to get out there and play! I think my daughter would love Nick’s Very First Day of Baseball! She is 4.5, reads on a 3rd grade level, and played t-ball for the first time this year. This sounds like an awesome way to help her continue to learn about the sport! Magic Bat Day sounds like a wonderful book to read. My daughter would love reading a book that helps with baseball and makes it fun too. all their books look great for kids learning from them is great. i want to read magic bat day. it sounds like a cute read. It is great to teach young kids sports in an interactive way. Such a great idea to use. I think both books are a great way to encourage kids to learn about baseball. 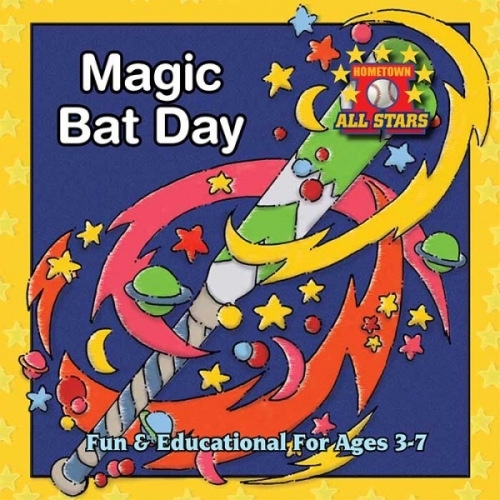 I would like to read magic bat day to my son Cooper. Looks like an exciting read.